We didn't get the snow predicted last night, only an inch. I was able to pick up plywood at the lumberyard about 5 miles away this afternoon. I had to cut my bench top -- can't keep it full length (temporarily) because I wanted to put plywood as a back panel to stiffen the bench up. And to provide support for the 2 vertical plywood dividers I plan to put in. 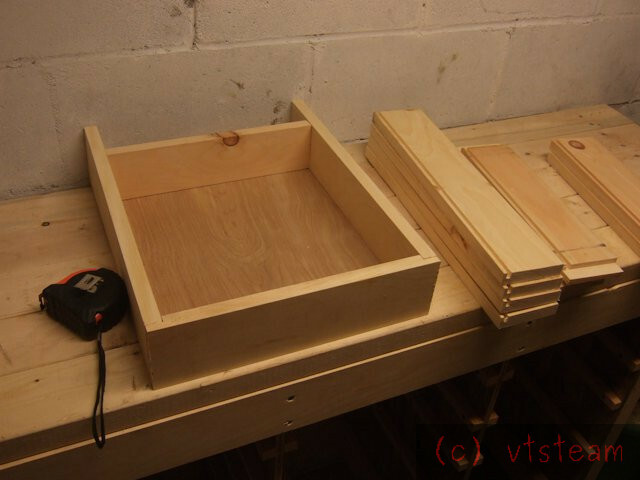 The dividers will hold the drawer slides to provide 3 vertical drawer sections. There was no way to move the bench out away from the wall if it extends full length. The chimney blocks it from being moved out. No way to fasten the back panel on. Or the vertical dividers. So I cut the bench top down to 5 feet. I'll replace the missing 3 foot length when the dividers are in place. Here's a photo of the top after cutting it short. The ply back panel is sitting on top of the bench. 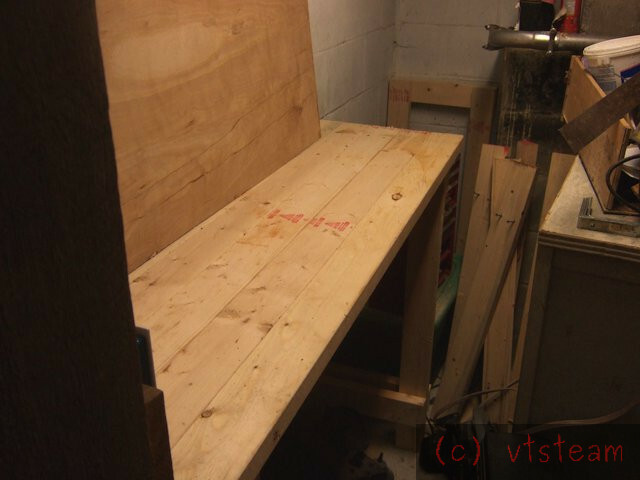 I later scooched the bench out and clambered in behind it, and fastened the panel in place. This is the only photo -- so much stuff in the shop I had to shoot through the door. Oh the joys of a tiny shop. You will soon learn to choreograph your moves around it. In my little (perhaps not tiny) shop I hang whatever I can on the walls - Would use the ceiling too if I wasn't 6'3" tall and the ceiling a tad taller than me. (Tad: "a scientific measure slightly less than a smidgeon"). Yeah I know we have gone metric here in OZ but I was that high way before metric. In the making of swarf process though, I use metric almost exclusively. How much do you have to pay for your timber over there ? I was thinking of 3" X 2" scantlings and 8' X 4' ply panels. Swarf I used to design and build boats, so fitting a lot in limited space is something I'm used to. Though not on land! 6-4 -- man you're up there! Dave, scantlings -- you must be a sailor, too...... the 1/4" 4x8 plywood I bought called "Luan" was $17 per sheet. But the term Luan is mistaken. That used to signify a weak soft Phillipine mahogany with a thick core and very thin faces. This time at the lumberyard, what they called "Luan" was actually birch faced plywood -- very strong and hard faced -- ideal for what I wanted, so I went with that. Ordinarily I would have preferred Douglas fir plywood, but that is now $32 a sheet for 1/4" thick AC grade (good one face, C grade other face). In the US after the War, native Douglas fir plywood used to be the standard. Now it's getting scarce and expensive. For regular timber -- I would normally saw my own from pine since I have a sawmill. But the weather is just not good for that now, and I want to get this shop done, so I bought 2 by 4s. These are spruce (in the Northeast) and measure 1-1/2" x 3-1/2" actual. An 8 footer is about $3, locally. The quality is dismal -- so I usually have to pick through the piles at the lumberyard, and sight down every piece to find a straight one. I'd say the reject rate is about 50% on a fresh stack, for me. Worse if an old stack. I am with you on the quality it has gone down so mutch ,I once sent a whole load of timber back 250 cu foot it was so bad . Jeff, true. Yesterday I had to go back to the office at the lumberyard to correct the slip they gave me -- I'd already loaded 2 sheets of plywood with a yard man's help. I needed a 2x6 to finish. And he said he'd get it and load it while I was in the office. I hesitated. I always like to pick my own lumber. So I said, "Okay, but make sure it's a straight one." He said he would. I got back to the truck and sighted down the 2x6. It had cross grain and a big bend at one end. The yard man was gone so I walked the piece back to the stacks, and after sorting through 4 other pieces finally found a straight one. The sad thing is, I don't think he was trying to pull a fast one. I think he truly didn't know the difference. He probably never brought the end up to his eye -- just looked at it from afar and thought it was straight. Anyway -- not much done today on the shop. Late afternoon I hunted up an old salvaged sheet of 1/2" plywood that was leaning against a storage shed. It was in good shape still, even though it had spent 10 years there -- protected by some metal roofing in front and the shed overhang. Just the bottom edge near the ground had rotted for a couple inches. So, that saved about $35 in plywood. 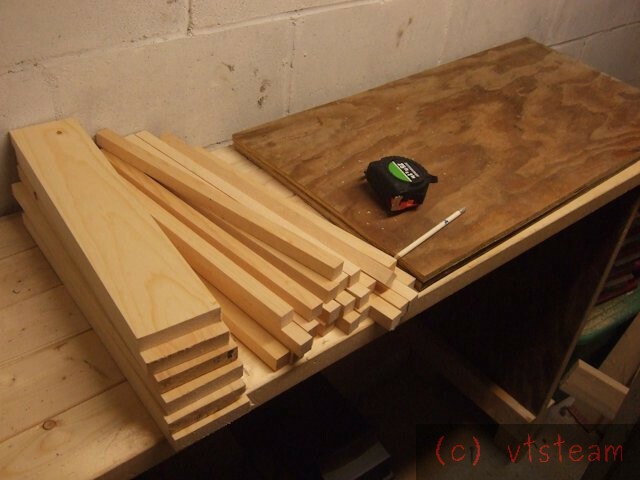 I cut the sheet up into 4 pieces for 4 vertical dividers to go into the bench. Two against the end legs, and two hanging in the center. These pieces will carry the drawer slides, The two end pieces sit on top of the leg cleats. The two center pieces are 3-1/2" longer and will get 1by4 cleats to match on either side. 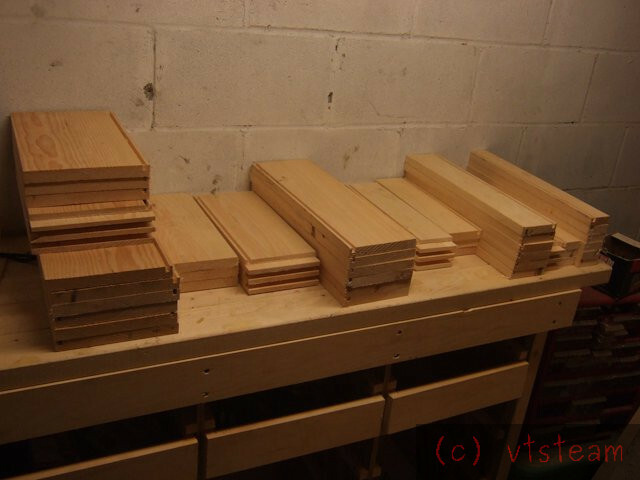 These together will form the bottom most drawer slides for 3 drawer sections. Sorry, no pics today -- it got too dark too quickly. 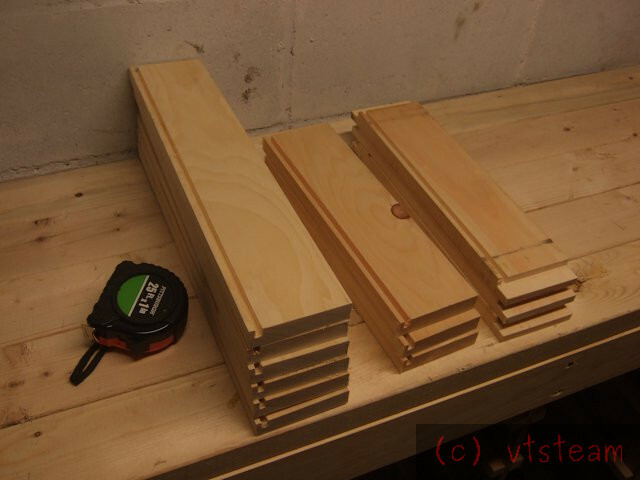 I ripped up some 1 by 6 into 3/4" square x 17" drawer slides, and cut some 1 by 4 into 17" lengths for the bottom slides. The salvaged plywood for dividers is also on top of the bench. One of the plywood end pieces is just sitting in place to check fit, on top of the back leg cleat. 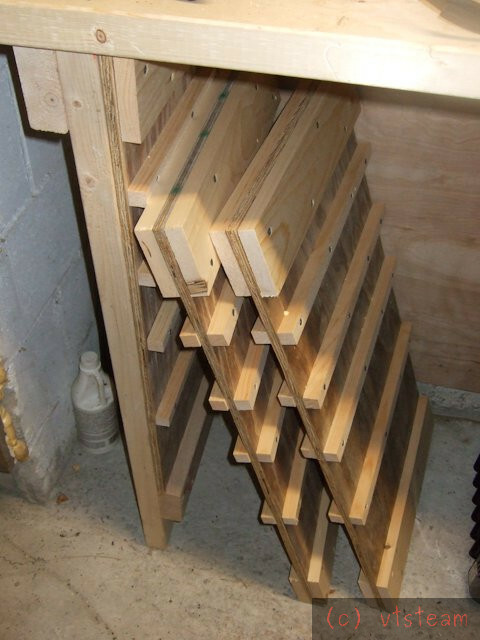 It will get drawer slides glued and fastened in place first before screwing to the legs. 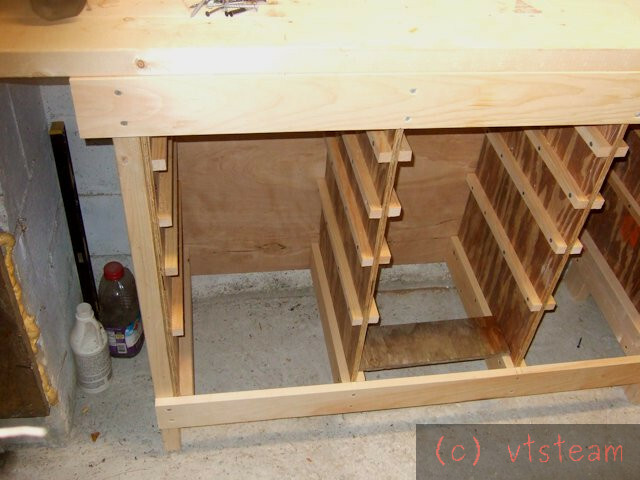 Today, I sanded the plywood end panels and divider panels, and began gluing and screwing the drawer slides in position. Here is a finished end panel in position. It sits on top of the 2x4 leg cleat, and that cleat also serves as the bottom slide. The two divider panels. These are 3-1/2" longer than the side panels and have 1 by 4's screwed to the bottom to act as slides for the same drawer that will ride on the leg cleats of the side panels. All ready to go for attachment to the bench tomorrow. This build has given me some ideas about use of space I hadn't considered..
Andrew, my messiness can overcome any structure! I need to practice discipline in putting things away after I use them! Always seems to happen that I get called in to dinner, or off to a meeting after working outside, so I grab all the tools and pile them on the bench. I gotta start planning on finishing and cleaning up, BEFORE the end of the day,or some other deadline. Hard to do for me -- I always want to do twice as much as will fit in any particular hour. DMIOM, I actually do have one -- and great idea! But different dimensions since this space is so narrow, and unfortunately, different size drawers. But good one! BackofEnv, Great I hope something here is useful! This bench is pretty much designed by Dave Gingery, with some changes for dimensions and the top material and divider thickness. Today, I added the dividers, and scooched the bench out again to fasten them in place to the backboard. 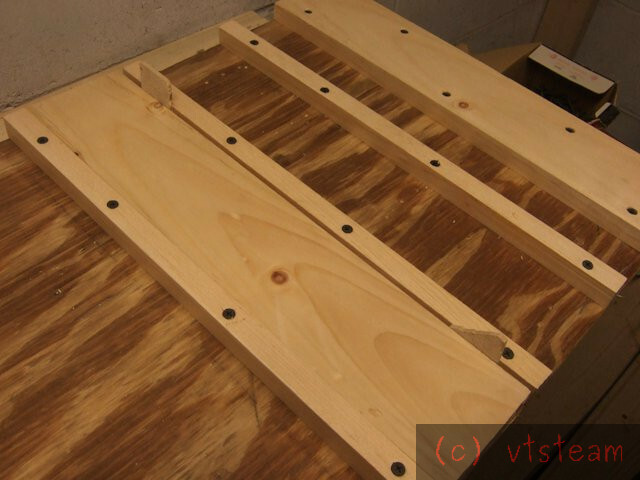 A strip of 1x 4 was added to the top and bottom on the front side of the bench to fasten the dividers there as well. I cut a piece of scrap plywood as a spacer gauge while screwing the dividers in place, you can see it in the pic below. It's exactly the desired divider spacing (greater than the actual drawer size), and I slid it in, top and bottom, front and back while fastening each section. If it slides and fits everywhere, that's perfect. And it does. A lot easier than measuring and marking, and keeping things aligned by hand. With the dividers in place, it was time to start on the drawers. 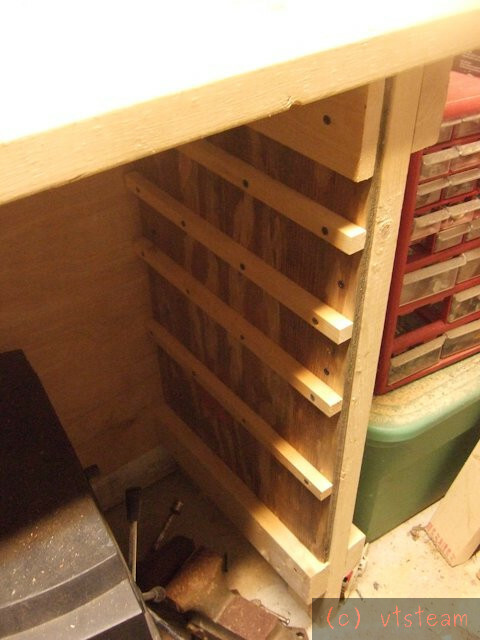 First thing I did was put a dado in a couple long pieces of stock, which will accept the 1/4" plywood drawer bottom. I did it with just a small combinaton blade on my old Craftsman 8" table saw -- so it took 3 passes to get a 1/4" wide groove. Then I chopped those up into the various lengths needed for the drawers. There's enough stock here for 3 drawers -- I didn't want to cut all 15 drawers worth of parts at once in case of a measurement error someplace. 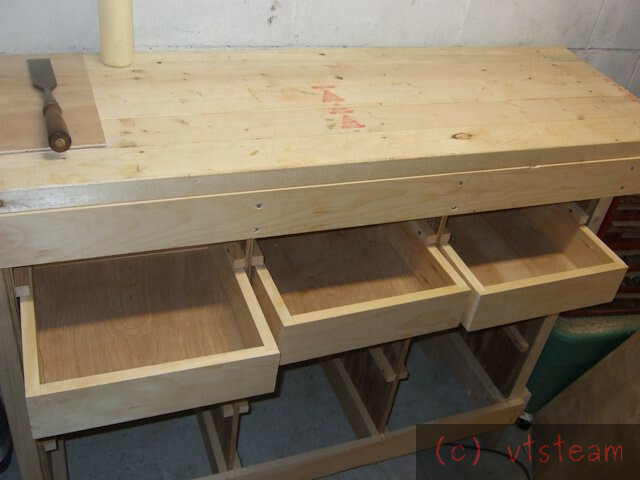 The drawer fronts (far right) get a rabbet to take the drawer sides as well. This was done on the table saw using both the fence and miter gauge, with a piece of scrap wood as a spacer. 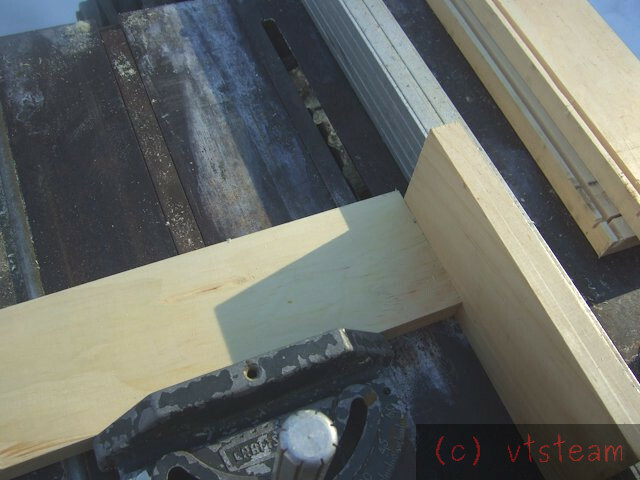 Here's how I set up the first cut of the drawer front rabbet using both the fence and miter gauge. Generally it's not a good idea to use both at the same time, or the cut can bind. But if you put a piece of scrap wood against the fence behind the saw's blade slot, it can act as a length stop for your material in the miter gauge, But when the gauge is pushed forward the work is clear of the scrap block at the cutting edge, so doesn't bind. And glued and fastened together. They work fine, and I didn't cut anything short (unusual! ), so tomorrow, on to the other 12! i like those draws a lot, nice and sturdy. Steve this is revealing a high level of wood working skills - pulled through no doubt from your boat building past ? Thanks kindly, boys! Just some plain carpentry -- I think anybody can do it. Boatbuilding was different. Everything is curves in 3 dimensions, and fitting is hand work with chisels, and short planes. Boatbuilder's use bandsaws, joiners use table saws. I'm not a very experienced carpenter (straight line man), even though I spent years building boats. Actually, the biggest thing that helped me learn to use a table saw was taking wood shop in 7th grade -- they don't teach that in schools anymore. Used to be you'd make a chessboard, and turn a cherry salad bowl. Now that's all too dangerous for kids. Good quality timber you have there , iff I went to the timber yard over hear I would still be looking , its grown as a crop and is cutt to soon and the notts don't grow out , looking good . ...I need to practice discipline in putting things away after I use them! .. Thanks for that, I like a good laugh. But seriously, those are fine drawers. Chipenter, yes it was nice pine -- a few knots, but easy to put them in the back or sides of the drawer. It wasn't cheap, though. About $75 for the material to do the drawers and front trim. The yard I bought it at doesn't have lower grade pine, so that was the only choice. When I saw pine with my own mill, the quality isn't as good from my own trees, but the quantity makes up for it, since you can cut out the knots. David, well I'm hoping with a tiny shop this old dog will at least try to learn new tricks! Thanks, boys for the kind comments! Today I finished molding and cutting out the pieces for the other 12 drawers. Made a few small mistakes, but none that I couldn't fix -- I've learned over the years to cut my longest pieces first, so if I mess up, I can cut shorter pieces out of it. That saved me twice here, because I bought nearly exactly what I needed, and no more. Had the table saw throw about a 1/4" (6mm) cube of white pine at me -- you'd think something that light and small wouldn't do much, but it hit me on the back of the middle finger, and it is now swollen and stings like heck. Felt like I'd got hit by a good sized rock. No damage, but glad it didn't go for the face. Stood off to the side more while sawing after that. I always find it funny that Design Technology and Resistant Materials (couldn't just call it woodworking) was my least favourite class in school. Had no idea at the time that it'd become my number one thing. Still, doing nice carpentry takes more patience than I have. I bungle most projects that I set out to make nice since I start getting fed up with them and rush it.